Here, at the Swan, we love our outside catering services and we know you will too! We’re famous for our delicious home cooked food and our personal, professional service. That’s why we’re confident we will impress regardless of the event. Whether you’re holding a business meeting, celebrating a christening or hosting a family get-together, we would love to show you what we can do! Why you will love our Outside Catering! We’re always available for you to contact with regards to your event. We pride ourselves on building strong relationships with our clients. So, if you have an urgent change or dietary requirements we always do our best to accommodate you. Here, at the Swan, we always listen to your individual requirements. It’s your event and we work hard to ensure it goes off without a hitch. 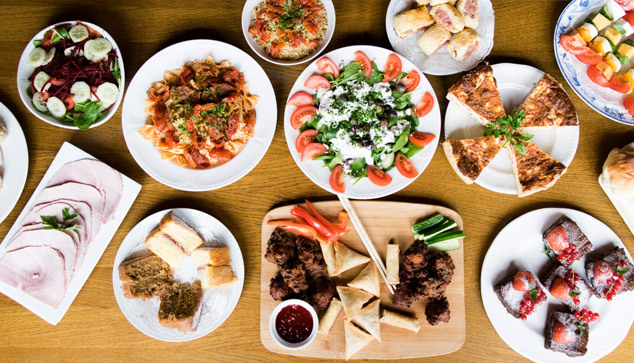 We’re renowned for our reliable and efficient outside catering service for a reason and it’s down to our willingness to listen to the needs of everyone. As it says in the good pub guide, we’re best known for our ‘genuinely helpful, thoughtful service’ and that’s what we always bring to any of our outside catering events. A personal, professional service which your guests will remember. Our food isn’t simply exquisite, home cooked and with the freshest locally sourced ingredients. It’s also always honestly priced. All the food on our outside catering menu is lovingly prepared with fresh, locally sourced ingredients from across Leicestershire. When you choose the Swan to host your event, you’re choosing an efficient catering service you can rely on. 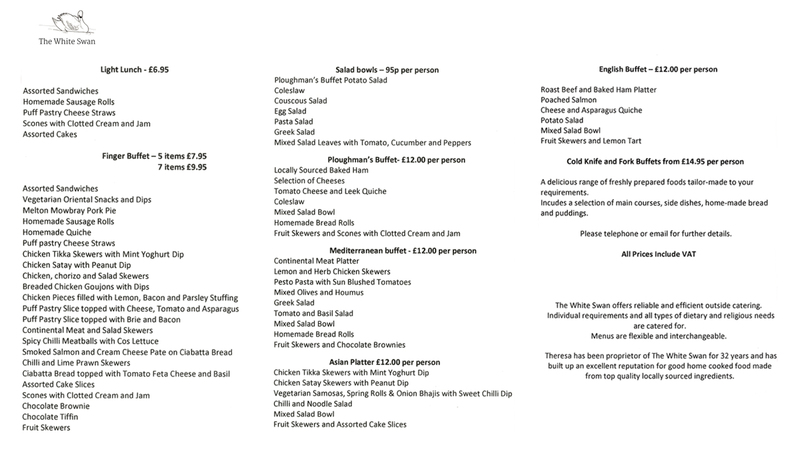 With a varied menu to choose from you can be assured there is always something for you. Remember, we can always provide a bespoke menu tailor made to your own unique requirements! See the cold knife and fork buffet section of our menu for more details. Have any of these dishes whet your appetite? Then don’t hesitate to check out our Outside Catering Menu here! Book your outside catering service today! So now you know why we love our outside catering! If you think we can help you at your upcoming event then please don’t hesitate to get in touch either via our website or by calling 01509814832. Our friendly, professional team are always on hand to answer any questions you may have.